Welcome to our Close To My Heart Stamp of the Month Blog Hop! We will be featuring October's SOTM, which is Holiday Warmth, a set of 11 stamps. If you have come here from Wendy's Blog, you are on the right path! This month we have over 60 Close To My Heart Consultants, split up into 3 different groups, sharing their creations using this month's SOTM and other great CTMH products on their blogs. This is simple to do - just click on the link at the end of the post on each blog to move to the next one! Here we go! This stamp set just screamed Christmas layout to me. I had a whole bunch of pictures from last Christmas that were begging to be put on a layout. Click on the image to be able to view it in more detail. Now "Hop" on over to Lori's Blog to see her work! Be sure to visit all the Consultants at their Blogs to get some great crafting ideas and other fun ideas! Remember, the Holiday Warmth SOTM is only available until October 31st! Click here to see how you can get this stamp set at a discount or even free! If you get lost on the hop or find links that aren't working, click HERE for a complete list of the 3 participating groups. Create a unique gift or decoration for your home. This Close To My Heart Display Album can be used as a 12 month calendar or an album to show off all those cute pictures you took during the last year. I’ll supply the instructions and stamps. All you need to do is put the pages together and add the pictures. Reserve your spot today by emailing me at jessicadbooth@hotmail.com. Just two openings left. This month Craft Club was at my house, which meant I got to pick the project. It took me awhile to decide, but in the end we made Dry Erase Boards. They are super cute, really easy and great to help you stay organized or give as a gift. It was a small group this month, but a wonderful night chatting with the gals and being crafty. We even had a new Craft Club member, Hope, come this month! I had to put some finishing touches on my after wards, but here is my completed project. Julie's super cute board. She is going to put hers on the side of her frig. Lynette's very creative board. I know she can't wait to hang it up in her new room!! I just love the frame she picked out to use. Sorry, Hope....we didn't get a picture of yours! It was just as cute though. I know your Husband will be super happy to know your work schedule from now on. 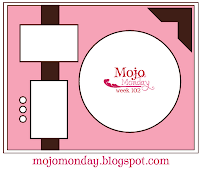 I made this Mojo Monday card a few weeks ago. Just wanted to share. The past two weekends we've had some fun garage sale adventures. Shane and I have hit some on Fridays together lately if we are out running errands and see something exciting. Last weekend we scored a $5 slide that you can use with a hose and make into a water slide. And a big box of large house Christmas lights for $5. Then sometimes on Saturdays Kenny will join the fun if we are out and about and see something of interest. We stopped at one on our way home and found Shane a Leap Pad and 5 books. He just loves it. Along with a travel Lite Bright and Etch-A-Sketch for a sum total of $9.50!! This weekend we found Dodger some nice yellow tennis balls 2 for .25 cents. My big score was 8 harvest colored place mats and matching table runner, brand new, from Crate and Barrel for $10! I just love the adventure of trying to find a treasure in the midst of all the stuff. As you may have noticed there have been a few changes to my blog over the past week. I've added a new header, started labeling my posts, have a list of labels on the right hand side and have included more of my workshops and information also on the right hand side of the blog. I originally started blogging so that friends and family could keep up with our daily lives and watch Shane grow from a far. Over time I've found it a wonderful place to express myself, share things that I have created and things that I have enjoyed. I'm hoping now that besides just being a place for friends and family to watch our comings and goings, it may also be a place for others to find inspiration and information. I love creating things and I love exploring our community with Shane. I hope that my posts can help others with their creative side or help them discover a new place to visit in our wonderful corner of the world: The Pacific Northwest. Receiving comments and feedback on my blog posts is part of what keeps me going every day. If you would like to share a thought or experience feel free to leave me a comment on any post at any time. I would love to hear what you have to say as well! Shane and I have made multiply trips this summer and now fall to the South 47 Farm, where he just loves the Farm Tot program. Each week they have a different theme and they get to pick a different vegetable or flowers. The first time this year we picked sunflowers. The 2nd time we visited with Dahlia, we picked green beans. And this week we headed there again with Dahlia and picked Bok Choy. I was super excited to take the Bok Choy back with us and cook it. I had never tried it, but they gave us a yummy recipe I thought I could whip up. Well, I liked it, but neither kiddo wanted anything to do with our freshly cut Bok Choy. Can't say I was totally suprised, but one can hope. They never seem to tire of the hay ride we get every time we go or feeding the pygmy goats and alpacas. Last weekend as I was off scrapbooking and Shane was off playing with Grandma and Grandpa, Kenny took some time to hike Mt. Si in North Bend. The 4 mile trail up the mountain has a 3,200 foot gain in elevation. I was happy he decided to do this one with out me, because it sounded like quite the hike. He made it to the top and then proceed to run all the way down it. I heard about some sore thighs for the next week! Kenny was pretty excited about the views from the top. You can see Mt. Rainer off in the distance. I'm extremely excited to announce my Christmas Card Workshop for this year. The design has been in my head and on paper for about a month now and last night I finally got the time to put it all together. Click on the picture to view a larger image of the cards. 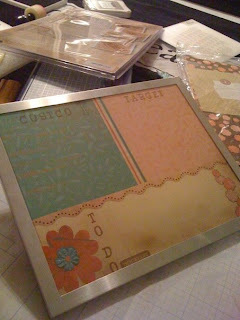 You'll have the opportunity to make sets of 10 cards (10, 20, 30 etc) Each set of 10 is $12.50. Featured card colors are: Cocoa, Olive and Tulip. Each 4x4 card features a special technique: liquid glass, prism glitter, fun flock, second generation stamping and 3D foam. You'll make 2 of each design per set of 10 cards. Envelopes are included in the workshop fee. There may be slight changes made to the above pictured cards for the workshop. If you are unable to attend a workshop, but would love to send handmade cards to your friends and family this holiday season, you can purchase a completed set of 20 for $30 (plus shipping and handling). Contact me at jessicadbooth@hotmail.com to reserve your workshop spot or to order your completed set of cards. This morning we went to out first day back at Lake Washington Toddler Group. Shane was so excited to go to "school" and see Teacher Kris. I got him dressed this morning and asked him if I could take his picture and asked him to pick a spot to stand. He then proceed to drag out his bathroom stool to the living room and sit on it. He told me this is where he wanted his picture. Then he struck all these poses. I think maybe he has been to the portrait studio a few to many times. I'm back from my scrapbooking retreat weekend away at The Keepsake Cottage in Auburn, WA. Just like last year, it was a great weekend of basically just scrapbooking and hanging out with friends. I completed 77 pages. Of course, I would have loved to come home with an empty box of pictures. But I am certainly closer to the bottom then I was when I arrived on Friday. I did come prepared with 2 of my 18 page workshop layouts completed. Which gave me a jump start on 36 pages. My completed stack of layouts. My long weekend away with out much sleep is starting to catch up with me. So I quickly snapped a few pictures of my favorite single page layouts. 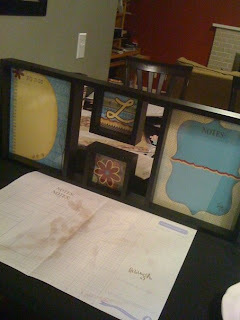 I'm starting to gear up for my scrapbooking retreat this week. Three days of friends, fun, food and scrapbooking. Shane is headed off to Grandma and Grandpa's for the weekend. Which leaves Kenny at home with the dogs. Wonder what kind of trouble they'll get into? It should be a great weekend for all. Stay tuned for details on my fun weekend away. It seemed to be a card kinda weekend. Maybe it was the weather, but I just kept coming back to make more. This baby card was inspired by Wendy over at Wizards Hangout. Featured colors: Indian Corn Blue, Garden Green and Chocolate. This card was inspired by Nona. It uses the September stamp of the month, Treasures. Featured colors are Barn Red, Honey and Indian Corn Blue. The next 4 cards I used the stamp set from the Everyday Celebration card kit from CTMH this month. I'm finding it a lot of fun to use. All the supplies used above can be found at my website http://jessicabooth.myctmh.com/. I thought I would try my hand at some Mojo Madness this Labor Day Monday. I'm absolutely in love with this card. I was inspired by the colors from Color Me Monday on Jeanette Lynton's blog. Supplies are all from Close To My Heart. I won a blog candy drawing this morning on Moneywise Moms. How cool is that. Goes to show you some lucky dog has to win and this time I did. This is a great blog full of ways to save money in general. It's a daily read for me. 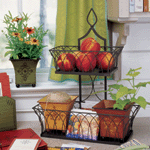 I won a Southern Living at Home Farmhouse Tiered Basket. Kenny and Shane visited the Reptile Zoo in Monroe today. I decided I would sit out this visit. Reptiles just aren't my favorite type of animal. Kenny said it was fun, a cheap quick hour of entertainment. Sounds like the place could use a little over haul though. The highlight of course was Shane holding an orange (colors are big in our house right now) snake. He started out pretty hesitant but still did it. What a brave little guy! This is the 200lb anaconda. Kenny said the picture doesn't do him justice at all. His middle was bigger then Kenny's waste. They also have a two headed turtle and an albino alligator. Last week I drove by a road side stand of Dahlia flowers. There were so many beautiful ones it was hard to pick which ones to bring home with me. Before this I would have told you I wasn't a huge fan of Dahlia's but I now am in love. They are so colorful with so many perfect details. With two Golden Retrievers in our house there is a lot of furry lovin' going on. Shane has taken to them even more then ever in the past two weeks. He is constantly trying to tell them where to go or what to do, letting them in and out of the slider and just plain playing with them. Kenny found him this morning watching Sesame Street using Sadie as a pillow. Even Sadie and Dodger get into the lovin' action together. We've been working on this sunflower all summer long. Shane brought it home from toddler group in June in a tiny paper cup. It's been replanted twice and water daily. Shane has done a great job helping to take care of it. We thought it might never bloom, and just keep growing taller and taller. Finally, we got a tiny little sunflower on top of an eight foot tall stem. Next year we'll have to make sure our sunflowers get planted where they can get a little more sun.